Well, I read FIVE books in February. How dreadful, and something that must be addressed. The TBR only has that gap really because I have taken some books off it for challenges! But it does have a gap, right? I am enjoying my new policy of reading one from the oldest end, one from the newest end and one from the Kindle in a cycle. 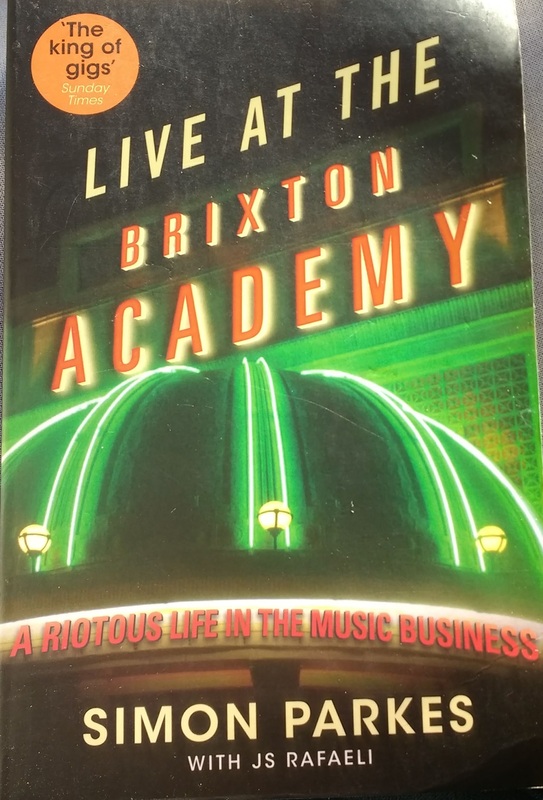 So I’m currently reading this one, “Live at the Brixton Academy” by Simon Parkes, which is fascinating, especially as I went to quite a few gigs there myself in my London days. I haven’t really warmed to the author, but it’s an interesting read so that’s fine. 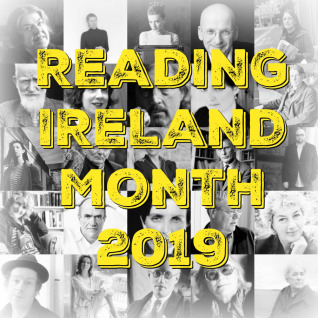 Very excitingly, I’ve managed to find books for two nice challenges this month: Reading Ireland Month (read about that one at 746 Books here) and Wales Readathon (the first ever one, hosted by BookJotter here). 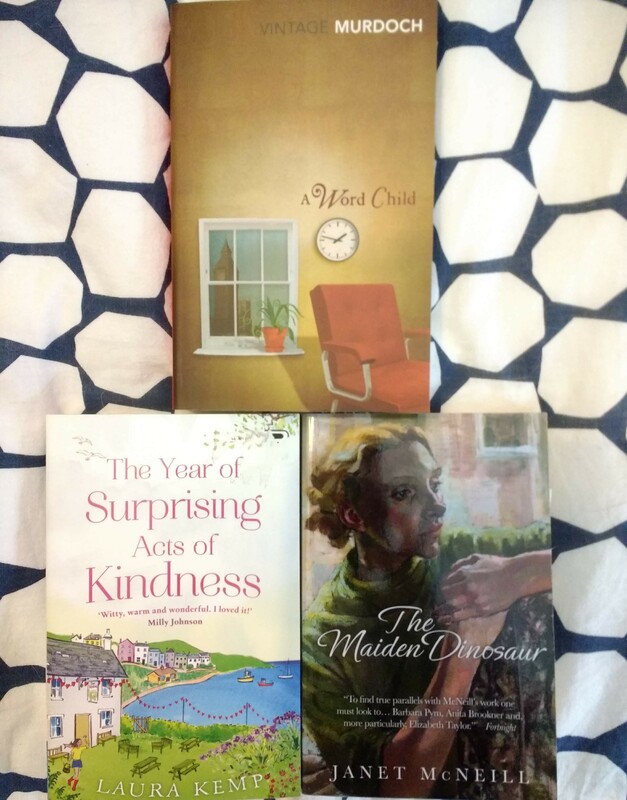 Cathy always generously lets me use Iris Murdoch as an Irish writer, so the wonderful “A Word Child”, which is up next after the Brixton one, will count towards it, and I also have Janet McNeill’s “The Maiden Dinosaur” which I think I won in her giveaway during this month last year. For the Wales Readathon I have the light novel, “The Year of Surprising Acts of Kindness” which is set in West Wales; the author, Laura Kemp, lives in Cardiff. So I’m hoping that counts! Both of these were off the middle of the front of the TBR, so a win all round! 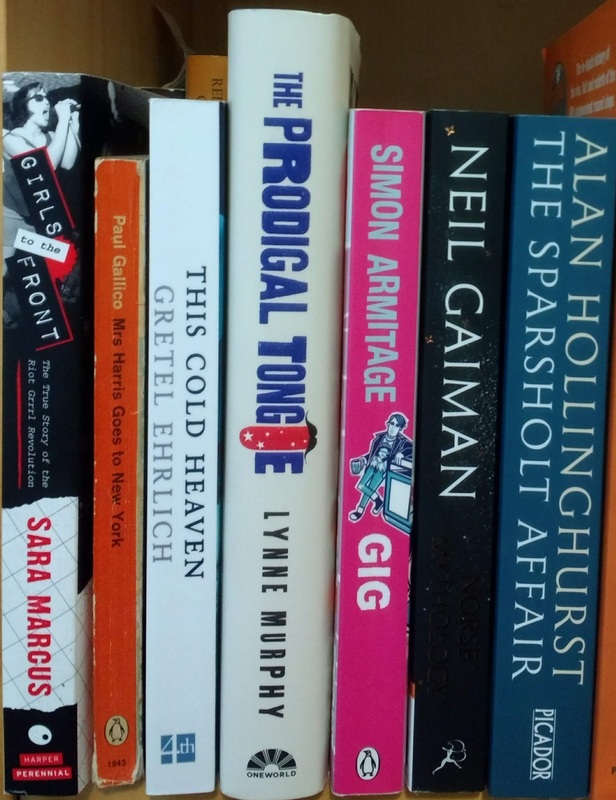 Here’s the beginning of the TBR – fortunate that I have a Kindle book to come between the two music books, unless I chose Dave Grohl’s mum’s one about rock mums. Some good travel, novels, language, memoir and Norse gods here. … and at the end, some nice birthday books with a bit of National Trust and Alabama and a lovely Persephone. Let’s hope I get to more than five books this month. Have you read any of these? Any ones I can look forward to particularly enjoying? Are you taking part in any challenges this month? I do hope you enjoy The Maiden Dinosaur. It’s a lovely book. I did have a moment of d’oh! when I was looking for Irish books in my TBR. Oh yes, right?! Next up after the Welsh one! It certainly does count, Liz. Many thanks for the mention – hope you have a great Dewithon! Great stuff, and it’s up next on the reading pile! Good to know that approach to choosing your next read is working for you. STILL not sure what happens in the middle but it’s nice to read books I chose recently! I read The Maiden Dinosaur for read Ireland month in 2016. I really enjoyed it. Hope you can squeeze in some more reading into March. I am joining in with read Ireland and dewithon as well as reading books for the LT Virago group’s ‘reading the 1940s’ event. Oh fabulous, will look out your review when I’ve read and reviewed (or feel free to link to yours in a comment). I have already finished one book this month so feel I’m doing quite well! No real chunksters, just not enough reading time, something I’m trying to address! Enjoy your Huge Russian! I love the idea of reading one book from the oldest end from your TBR and one from the newest end – I think I may adopt that plan too. I really enjoyed the book by Dave Grohl’s mum – it was good to dip in and out of. It’s interesting how the various mums interviewed felt about their child starting a band. I especially loved her insights about Foo Fighters and Dave Grohl – she has some fab stories! It’s quite a fun thing to do although I’m still not sure if I’ll ever get to the middle!! I am enjoying doing one from the Kindle in rotation, too. i am looking forward to the rock mums one. Good news. This Cold Heaven came highly recommended by Bookish Beck so that’s two good recs! I haven’t read any of the books in your photos, but many of them do look interesting to me too (especially the Paul Gallico, which would suit for a lighter read just now). And even though we might not be reading exactly the same things, we are both reading for Ireland and Wales this month! Good luck with your shelf/stack. Mine is slowly improving this year too. It was in the state of stacks turned with their butts facing outward as the new year began, and now all but two stacks have been righted to sit properly on the shelves and now show spines outward so it is much looser than it was, although much reading remains! The Gallico is the sequel to Mrs ‘Arris Goes to Paris which is great fun and should be read first. The others are a bit obscure to be honest! I’m curious about how putting the books the other way around makes more space, or were they on their fore-edges and double-stacked? Always looking to make more book space! This unit is older and has fixed short shelves; I had turned almost all of them so their bottoms are all facing outward, stacked not on fore-edges, so all you can see are the bottoms and you have to pull each stack off the unit completely in order to see the spines. It’s a terrible situation because you can’t see any of the books, which makes them even less enticing. Ah – I see now. I have a good few where a vertical pile, spines out, is more space-saving than the same books in normal format, some of those are two piles one in front of the other. 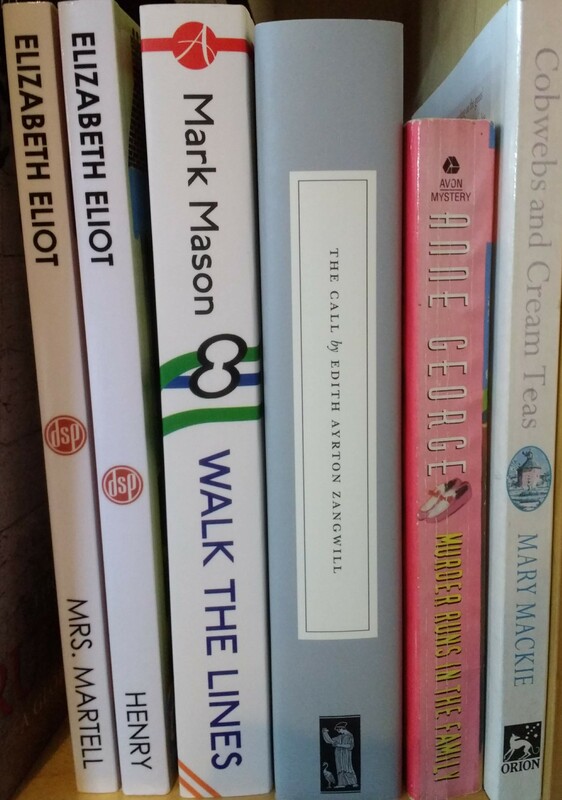 If you have time, we do recommend the Elizabeth Eliot books you have on your shelf….! Ah, yes, of course – I am naturally very much looking forward to getting to those, and it will take less time to reach them with my new book-choosing protocol!